Roger Ebert has been leading an online discussion among film buffs about the recent spate of 3-D movies. Is it just a gimmick to get people into the cinemas, or are films actually benefiting from the process? Ebert’s position, which I broadly agreed with, was that it’s still fairly pointless and prone to being (mis)used as a gimmick. I didn’t mind watching Bolt and Up in 3-D — computer animated films do seem to benefit the most from the treatment, as they are modelled in 3D in the first place — but both were just as enjoyable to me in 2-D. And you still have to wear those stupid glasses. 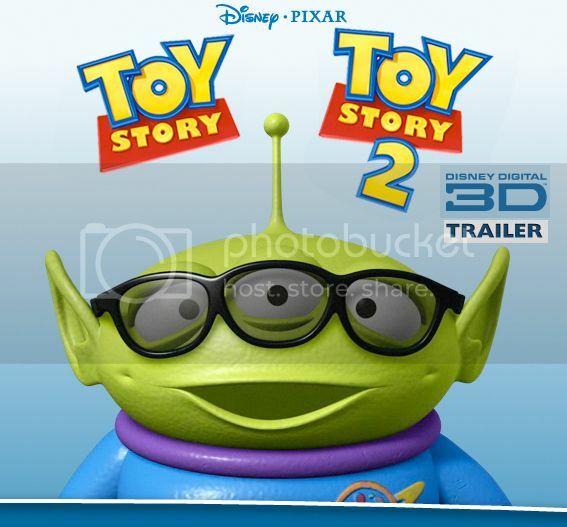 That said, I think retrofitting 3-D onto Toy Story 2 actually made it a better picture. We may have found the first exception to Ebert’s Rule. As you probably know, TS and TS2 are back in theatres in a new 3-D edition as a family double-feature (a great idea, with a wonderful little “intermission” in-between, including some new voicework, fun quizzes and so forth) to refresh people’s memories prior to the release of Toy Story 3 later this year. Most people have seen TS and TS2 either “back in the day” or a hundred times on DVD since then, so I won’t go over the story so much as my impressions of getting re-acquainted with the films. Though I remembered the overall plot and themes (particularly of TS2, which as a collector myself resonated with me a bit more), the specifics of the tales had slipped my mind and it was a delight to find that neither film has become too dated. The jokes still work, the overarching theme of the eventual fate of childhood toys (and the power of friendship) are still moving, the performances shine and the “nods” to adults are perhaps even a bit more shocking since they’re the least-remembered aspect, at least for me. Even better, since the film was created on 3D software in the first place, both benefit greatly from the 3D process, with TS2 coming off better mainly because of the improvement in the quality of the animation (and the greater range of locations). The best part of both movies is that the details hold up very well. TS’s animation is definitely flatter, but no less lacking in facial expressions and strong vocal performances. There were a few moments in the 1995 original that reminded me how far computer animation has come — a few moments where you see a shot executed poorly and think “ooh, that’s a bit videogamey,” but a number of sequences actually improve with the addition of perspective, particularly any flying Buzz Lightyear does. Re-living all the specifics again, from the decor and manner of Andy’s house to the contrast of Sid’s, from the nightmarish mutant toys (which you’d never see a Pixar film do now!) to the extended “chase” seen of the moving truck (reprised in essence in TS2) is a lot of fun, particularly when you can compare how much more advanced Pixar’s skills were just four years later when TS2 came out. Compare Scud (Sid’s dog in TS) to Buster in TS2 (a character I’d completely forgotten about) and you’ll see the great strides in technology and art the company managed in that short span of time. There’s not a lot more to say. 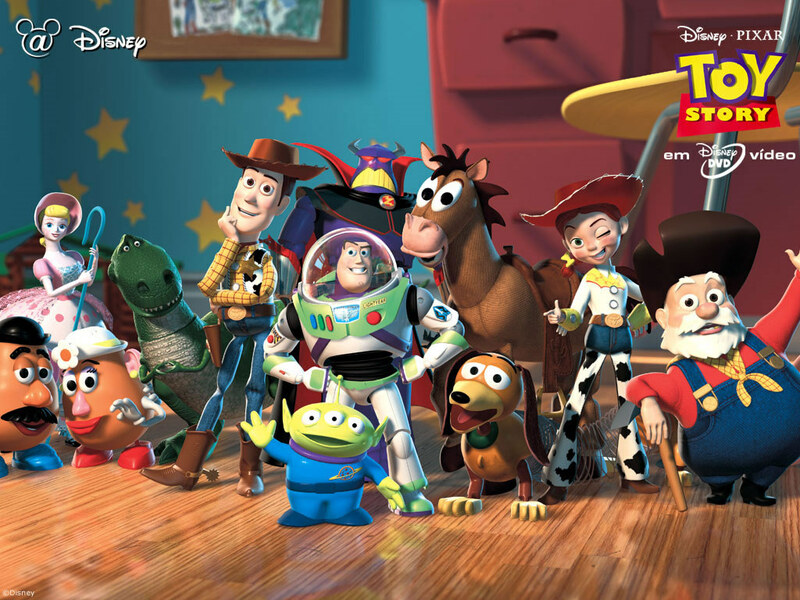 What Apple is to computers, Pixar is to computer animation — a clearly superior, reliably excellent product that may not always be the most popular or the most talked-about brand, but consistently sets the bar for story, detail, elegance and emotion. Go see it if you can, and if you miss it in theatres, let’s hope the Blu-Ray release comes with a few sets of special glasses. Michael Moore (and his films) are believed to be a “known commodity,” mostly by his enemies rather than his fans. In other words, people who don’t actually watch his movies think they know exactly what they’re going to get from all/any of them, so they don’t bother watching. Conservative circular logic at its finest. They use their favourite (and most effective) ploy of reducing him (or anyone they don’t like) to a caricature; they paint Moore as a fat narcissist liberal who hates everything conservative and particularly that very model of a modern capitalist general, General Motors. But, you’ll notice, they rarely take on his ideas directly. The reason for this is because although Moore may rub you the wrong way, in point of fact, he’s turned out to be right — and nothing infuriates a conservative more than having to confront this. So before we get into the movie, let’s address this directly. Yes, Moore is a pretty chunky guy — though since making Sicko two years ago, he’s dropped 70 pounds, and plans to lose another 70. Have you done that? No? Then STFU. Narcissist? Maybe. He does feature a lot of himself in his films, and I once asked him specifically about that. To summarize his longer answer, he feels strongly that it’s important that he make these movies personal, particularly in the narration. As for the “stunts” as some call them, he prefers the term “citizen confrontation” and asserts that he is acting the part of the audience if they had a chance to speak truth to power. The fact that these events are not always effective or realistic doesn’t make them irrelevant; Moore wants to show that ordinary people can still make their feelings known through such actions, and indeed would be more effective than just him doing it. When he puts crime scene tape around Wall Street, he’s not just making a statement, he’s inviting you to do something similar — because Moore still sees himself as the average joe. Seriously. Truthfully, it’s the media itself that has made Moore’s image narcissistic. They consistently prefer to focus their stories on him rather than any of the unsettling ideas actually in his films, because then they would have to tacitly acknowledge that he’s factually correct. So, finally, we get to “liberal.” This term (like “conservative”) has rather different meanings depending on where you are (both physically and politically), but I personally have never thought of Moore as being nearly as “liberal” as his critics allege. He’s much more an angry (but not all that far from centrist) Democrat and pragmatist with honestly mixed feelings about a lot of things, such as guns and yes, capitalism. He actually comes very much from the type of background that usually breeds conservatives, the small-town midwestern, sleepily and happily middle-class and stay-at-home world — and in fact he pines for more Americans to have that sort of background again! He reminds me very much of a lapsed Catholic (though he isn’t one, as it turns out) in that he is very shaped by the middle-class, pretty conservative (small “c”) background he came from, but has seen the ugly underbelly and wants it made right rather than swept under the rug. It’s the fault of the rich and their abusive policies towards the poor and union workers that has turned Moore into an alleged “super-liberal”; had the US maintained a respect for honest work and the middle class, Moore would probably have been at worst the local gadfly at the City Council meetings. Just by looking at him you can tell that he’d be no more comfortable at some Gay Pride-themed SoHo gallery opening than Newt Gingrich would. So what about capitalism? Does Moore hate it? I’d have to say “no, but he hates what it has become.” When describing his own upbringing and the world of good capitalism did for everyone back when it was in sync with and intermingled with the love of country and community that feeds and nurtures democracy, young Master Moore was probably capitalism’s biggest fan. It gave him a life and opportunities of incredibly high quality, better in fact than most people have available today — which is part of the point. Life really was pretty good for the majority of Americans, at least by comparison with now, in the late 50s and early 60s. 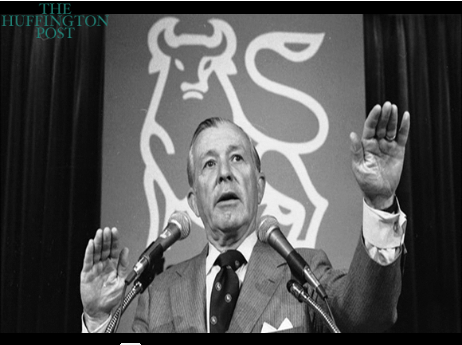 Along came the Reagan Administration in 1980, however, and they (specifically Don Regan, who was head of Goldman Sachs and then became Treasury Secretary, essentially handing the keys of the vault to Wall Street) allowed capitalism to become a very mean and heartless drunk, slurring his “I love you, maaaan” odes to the rich while ignoring his wife and kids (the middle class and poor, respectively) at home. Like a bad marriage, the family tried to ignore what was happening, tried to put on a brave face for the neighbours, and for a while that worked, but the façade began to crack, the abuse became difficult to hide, but it careened almost always out of control for far longer than you’d have expected and then eventually he drove himself into a ditch. Capitalism divorced itself from both the middle class and reality, gave up its egalitarian ideals and became a meth whore to the rich and powerful, ignoring everything else and letting the house it built (America) crumble. Twenty years ago, Moore was just a schlub outraged by the poor treatment of workers vs. shareholders at General Motors, and identified the root problem: a de-humanisation of the employees and customers in favour of making the rich richer in the belief that they — the rich — would take care of the little people (this idea is often expressed as “trickle down economics”) by providing them jobs (but nothing else really). At the time Roger & Me came out, Moore thought GM was some kind of rogue corporation, bending government to their will and putting their endless need for profit ahead of the people’s need for basic survival; 20 years on, Moore has discovered that pretty much all corporations have abandoned the democratic and moral principles of supporting the communities they profit from, and rushed headlong into a feeding frenzy for money that never gets sated, powered by a foolish Congress that gave them not just rights on par with actual people, but rights and access that superseded that of ordinary citizens. It’s irony at its very finest that the very groups of people who profess to be skeptical of Darwin’s evolutionary theories are largely the same ones who turned capitalism into a pure Darwinian exercise, replacing democracy and patriotism with the worship of profit and a “survival of the fittest richest” mantra. You read that right, by the way: democracy has been replaced by corporatocracy, and most of us never even noticed. A cynical few will yawn and act unsurprised, but the joke is on them: a “plutonomy,” as Citibank itself described it, will eventually make life very unpleasant for anyone not in the top one or two percent of earners. That means you. The 2006 Citibank memo that calmly and horrifically describes — to its wealthy clients, until it was leaked to Moore — a system of government that is now solely defined by its ability to produce economic benefit to the wealthy, and even questions how much longer the rich will let the concept of “one man, one vote” stand — is at best a treatise of treason, at worst a victory speech of the triumph over democracy, a war that was won through marketing, convincing people that having an XBox and a plasma TV equaled a higher standard of living. This is just one of the jaw-dropping revelations that will even shock and surprise lefties who consider themselves well-informed. Have you heard of a “Dead Peasant Policy”? You will in Moore’s film, and you may literally want to grab a torch and head for the mansions when you find out what it is. Or consider Capt. Ted “Sully” Sullenberger, the hero of the Hudson. He went to Congress to testify about the working conditions of the nation’s pilots. Don’t remember that? That’s because the networks refused to air what he said. When Moore shows you the (stolen) footage of his testimony, and then backs it up with interviews of working pilots, you may never want to set foot on an airplane again (which is not Moore’s intent; he wants you to help him do something about it, not stick your head in the sand). In addition to these revelations, made up mostly of “liberated” news footage that has been actively suppressed by corporate-owned media, Moore injects a surprising new voice beyond his own, or those of the victims of rampant corporate greed; the Catholic Church. As a practicing Catholic, Moore’s discontent with capitalism as a substitute for democracy has its roots in the Bible, and so he interviews a number of Catholic priests and bishops, who all enthusiastically agree that capitalism runs directly contrary to the teachings of Jesus and the words of God, and is a force of evil in the world (which even Moore is not ready to fully embrace). If this film does nothing else beyond Moore’s usual level of box office, I would love to see this film spark a real dialogue in the mainstream media featuring the religious view of where the West is headed these days, and how its model is something Jesus would run screaming from. Some critics have said that Moore’s ability to deliver such a huge indictment results in him being less focused, less “entertaining” and less cohesive in this film than in some of his previous ones where the subject was more narrow. With this I must agree, Capitalism as a piece of filmmaking is not Moore’s best work. But it is as important a documentary as anything he’s done, because it shows not only the growth of the corporatocracy, but also how the truths he uncovered in Flint, Michigan 20 years ago have now been exported to every corner of the US, from “condo vultures” in Miami to partying Wall Street executives, from bankrupt California (which is, by the way, one-seventh of the US economy) to the corporate infil-traitors in Washington DC. One does wish, especially in the early portion of the film, that Moore would zero in on his thesis and not throw everything and the kitchen sink up there; he cuts dizzingly between crying remnants of the working poor and the eviscerated middle class struggling and failing to keep even their dignity as they lose everything they’ve worked for, to his now-old-hat “stunts” to the shocking footage that either never aired or didn’t make it past the right-wing noise machine, to images from his typical American upbringing to the wasteland that is Flint (and a thousand small towns like it) today, to priests calmly telling us that our very way of life is intrinsically evil and ungodly. If Moore were a lawyer, I’m sure he’d get a hung jury every time, and his “citizen confrontations” have lost most of their novelty and effectiveness and now only serve to give his critics something to distract their audiences from the actual points raised in the film. But his winning, earnest, honest personality (which is precisely what he has, his defamers be damned) does eventually bring the disparate points together, not so much calling for the destruction of everything we know as its reformation; a return to the sensible, community-driven democracy that kept corporations and governments in their place (as servants to the greater good of the public) as it did for a while in the post-Depression America middle 20th century. The film strikes a cautiously optimistic tone regarding the election of Obama as a force for change and good, but doesn’t shy away from noting that Larry Summers and Tim Geithner are part of the same crooked crowd that overdid the champagne during the wealthy’s victory dance and thus wrecked the economy in the first place. Only time will tell if they’ve had a “come to Jesus” moment and are working for the taxpayers now, or if Obama and any noble intentions he once had will ultimately be eaten by the money and power of the corporate dragons he seeks to tame. Finally, after taking us back to Roman times in the film’s opening and his own childhood in the middle, he ends the film with yet another piece from a simpler time, which is also another piece of previously-suppressed footage: a sickly Franklin Roosevelt, in a never-before aired bit of newsreel footage, calling for and outlining his plan for a “Second Bill of Rights.” The truths and values Roosevelt lays out are simply stunning to modern audiences, and a powerful reminder that America once had truly great leaders who fought hard for the little guy, who considered the dispossessed and the disenfranchised when making their decisions, who weighted the benefit of the many ahead of the benefit of the few when spending their political capital. It’s clear that Moore hopes Obama will be another Roosevelt, but as he sternly warns us at the end, if we don’t get off the couch and reward good behaviour from our leaders, he — and those of us who fight for justice, peace and equality — will likely throw in the towel and let the forces of evil prevail. Why lead the charge if nobody is willing to take a break from playing WoW long enough to write their congressperson? I will allow that Moore does seriously need to refresh his schtick, if for no other reason to confound his enemies and re-energise his fans. But as a truth-teller, an investigative journalist and a thorn in the side of the corporatists, Moore is still the Elvis of documentarians and we should try to follow his example of looking more at the message and less at the real or imagined faults of the messenger.